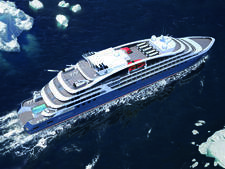 Le Lyrial is one of four sister ships in the fleet of Ponant, a French luxury expedition cruise line. 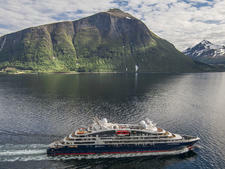 The ship is small, holding just 264 people, but manages to pack a lot into a small space, including a full-service spa, fitness center and a swimming pool. 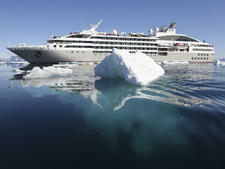 The ship has a wonderfully calm vibe, with a sedate elegance and a marine-inspired decor. We particularly loved the atrium sculpture, which mimics whirling columns of fish. 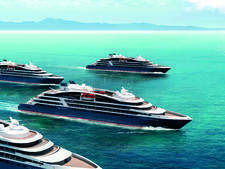 Ponant is a French line and the service, food and entertainment onboard are French. Announcements are made in French first, dinner is served late, the cuisine is French-inspired and entertainment in the theater is cabaret style, while in the lounge the singers channel their inner Edith Piaf. 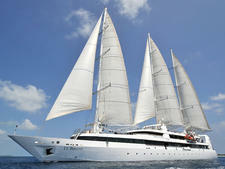 Le Lyrial sails primarily in Europe, South America and around Africa. When in Europe, it offers culturally rich itineraries throughout the Mediterranean. During the rest of the year, it sails expedition journeys to Antarctica, around the coast of South Africa and to the African islands (Seychelles, Madagascar, Mauritius, etc.). The onboard marina is stocked with kayaks and Zodiacs for use on these more exotic sailings. 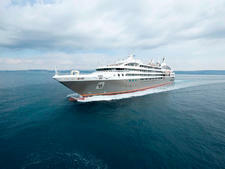 The majority of passengers on a Le Lyrial cruise are French, with a smattering of cruisers from English speaking-countries (mostly U.K. and Australia) as well as other European countries and occasionally Asia. You might also find yourself on a sailing in which part of the ship has been chartered by an American tour operator (such as Tauck). 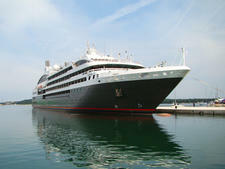 Cruises during school holidays will attract young French families, though not in large numbers. During the day and especially on shore excursions, casual, comfortable clothing is the norm. Depending on your itinerary, specific clothing might be recommended (waterproof, wind resistant, hiking boots, etc.). In the evening, attire is at passengers' discretion, though jeans, T-shirts and flip-flops are not permitted in Le Celeste main dining room. On Gala Nights, cruisers are encouraged to dress up in their finest but it's not required. Keep in mind, the French do tend to dress nicely for dinner. 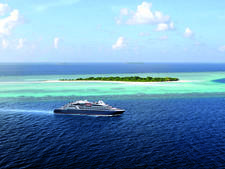 The cruise fare is only slightly inclusive on Le Lyrial with just drinks (soft and alcoholic, but not including premium brands) included in the price, as well as Wi-Fi. Shore excursions (with very few exceptions), laundry, tips and the spa are not included. The euro is the onboard currency.